Positive: Great built quality; nice display; powerful hardware; good ergonomy; fast fingerprint sensor. Negative: Relatively high price. 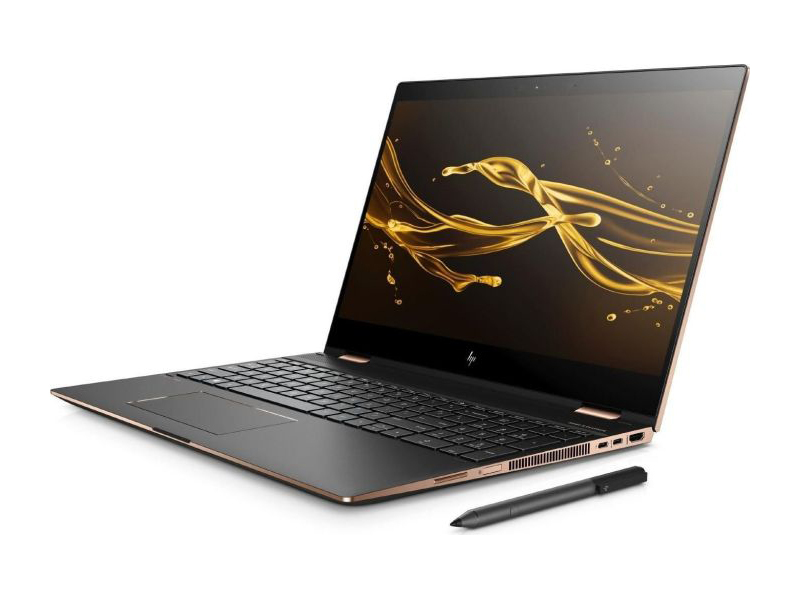 Model: HP uses the slogan “revolutionary power, extraordinarily thin” for the HP Spectre x360 series (2018), which includes 13-inch and 15-inch models. All models from 2018 feature an 8th generation Intel Core i7 processor. 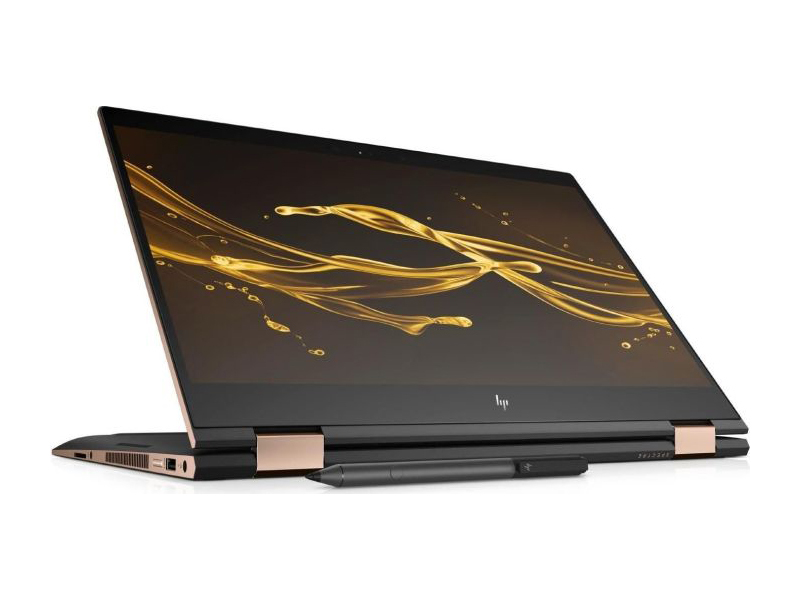 We will cover the HP Spectre x360 15-ch004ng with Intel Core i7-8705G and AMD Radeon RX Vega M 870 4 GB here, which is called HP Spectre x360 - 15t Touch Laptop in the US. 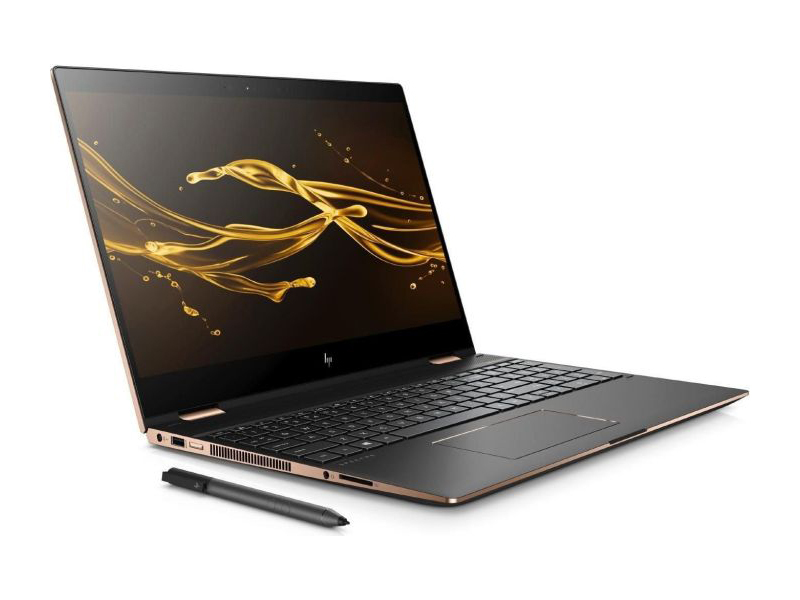 HP also offers variants of the HP Spectre x360 15 (2018) with Intel Core i7-8550U and Nvidia GeForce MX150 (2 GB GDDR5 dedicated). 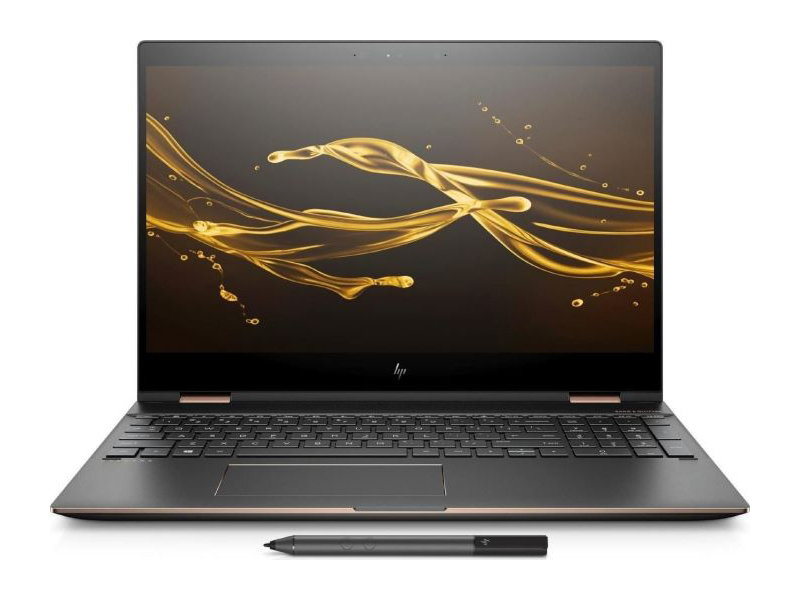 In any case, the HP Spectre x360 15 models feature a 15.6-inch 4K IPS micro-edge BrightView touch screen with WLED backlight, Corning Gorilla Glass, and a resolution of 3,840 x 2,160 pixels. The Spectre x360 15-inch has matte metal finish with copper accents. It measures at 35.9 x 25 x 1.94 cm and weighs at 2.14 kg according to the manufacturer’s specification. Size and weight can vary depending on the configuration. www.digitaltrends.com thinks the x360 15 feels rather conventional in the day-to-day. According to www.theverge.com the metal unibody design is quite sturdy, but keyboard and palmrest flex under exerted pressure. Moreover, they complain that the bottom plate and rubber feet don’t keep the laptop perfectly level on a desk. www.pcworld.com argues that thanks to a stiff chassis, you can pick up the Spectre x360 15 one-handed, and you needn’t fear that you’ll bend it. Thanks to its 360 degree hinge, the convertible can also be used as tablet. Since it is a large and heavy device, www.digitaltrends.com feels, “It’s not pleasant to hold”. www.theverge.com confirms that the device is far too heavy and unwieldy to use in tablet mode for any length of time. The laptop can be connected to wireless networks via an Intel Dual Band Wireless-AC 9260 802.11a/b/g/n/ac (2x2) module, which also supports Bluetooth 5. The interfaces include two Thunderbolt 3 ports (up to 40 Gbit/s), which supports DisplayPort 1.2, and HP Sleep and Charge, one USB 3.1 Gen 1 (HP Sleep and Charge), HDMI, a combined headphone/microphone jack, and an SD card reader. For security, the Spectre x360 15 features a fingerprint reader and a Trusted Platform Module (TPM). Moreover, facial recognition is supported. According to www.theverge.com, fingerprinting and facial recognition work well, but the latter is more convenient and faster. In www.digitaltrends.com’s opinion, the Spectre x360 15-inch's entirely conventional, long-travel keyboard with numpad feels great. In contrast, Stefan Etienne from www.theverge.com complains, “The keys are shallow with some resistance (though not as shallow as the MacBook’s), too small even for my nimble fingers, and generally just not a great experience to type on for long periods.” www.pcworld.com criticizes the half-height cursor keys for moving up and down. According to www.laptopmag.com the HP Spectre x360's keyboard allows for comfortable, speedy typing thanks to 1.4 millimeters of key travel and 69 grams of actuation force. www.digitaltrends.com evaluates, “[...] the Spectre’s touch surface felt finicky. It offered a poor sense of friction and occasionally failed to respond when expected.” www.theverge.com thinks the touchpad is oddly sized, being too wide on the sides and too short from the top and bottom. In addition to keyboard and touchpad, the laptop can be controlled with the X360’s multi-touch panel. HP’s Digital Pen is included. It offers 1.024 levels of sensitivity and www.digitaltrends.com calls it “functional but unimpressive”. The stylus can not be attached to the laptop. Hence it is easy to loose. A resolution of 3,840 x 2,160 pixels on a 15.6-inch screen gives a pixel density of 280 PPI. www.digitaltrends.com measured a contrast ratio came of 830:1, which is worse than the contrast ratio of their Dell XPS 15 2-in-1 test sample (1,460:1 contrast ratio, brighter, and lower black value). According to www.theverge.com the brightness is 340 cd/m², but the display lacks 100 percent Adobe RGB color coverage. For www.pcworld.com, who measured a slightly lower maximum of 319 cd/m² than www.theverge.com, the 4K screen could be a little brighter. According to www.laptopmag.com’s colorimeter , the Spectre x360 produces 119 percent of the sRGB spectrum. They say the screen produces crisp, bright and vivid images. 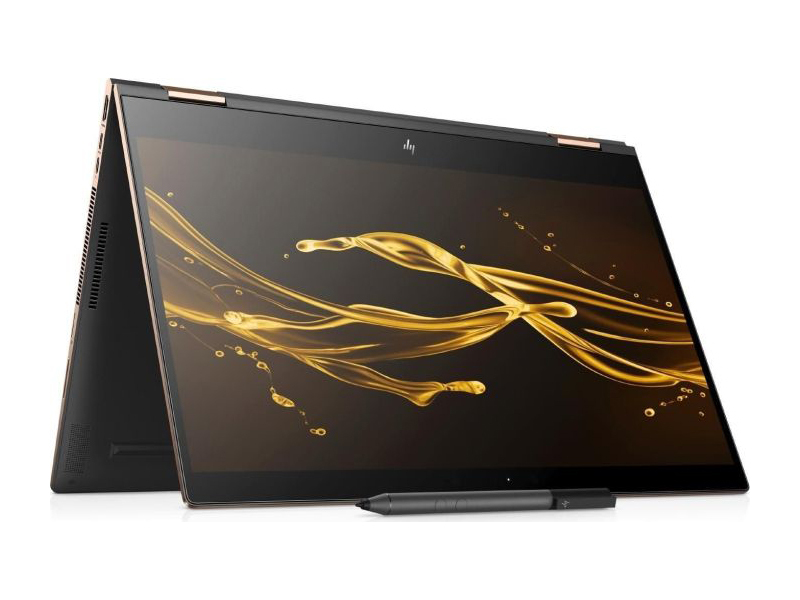 The HP Spectre x360 15-ch004ng features a Core i7-8705G and an AMD Radeon RX Vega M GL graphics. The 45W mobile processor with a Turbo frequency of up to 4.2 GHz and 8 MB of cache memory features four cores and eight threads. According to www.digitaltrends.com the CPU performance is about on par with their Dell XPS 15 2-in-1 test sample with the same processor, while Microsoft’s Surface Book 2 is slower. The discrete AMD Radeon RX Vega M GL is bundled with the Core i7-8705G in a single package. It is directly connected to the processor via Intel’s PCIe lanes, features 20 Compute Units and runs up to 1190 MHz boost frequency. 4 GB of low power dedicated HBM2 (High Bandwidth Memory Gen 2) VRAM ensure a memory bandwidth up to 205 GB/s. According to Intel’s benchmarks, the AMD Radeon RX Vega M GL’s performance should be in between the Nvidia GeForce GTX 1050 and 1050 Ti. Therefore, this graphics card should be well suited for 1080p gaming. 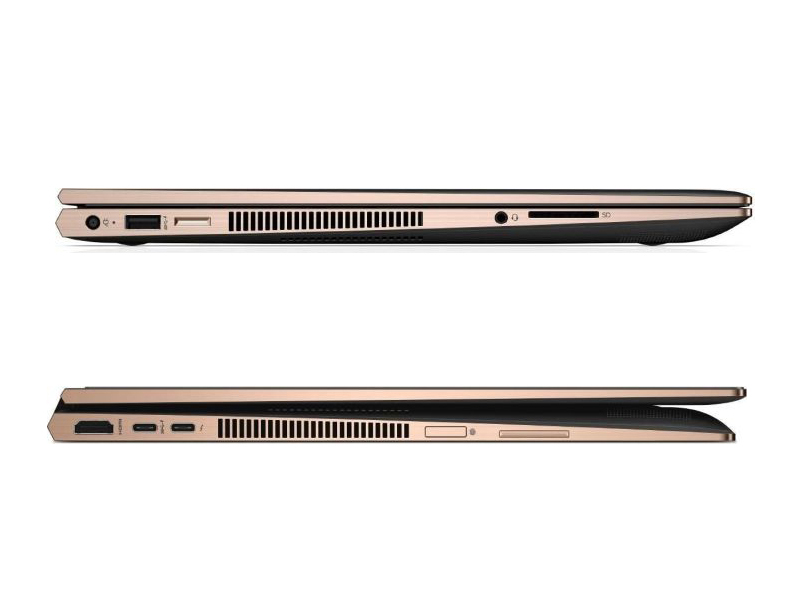 HP Spectre x360 15 variants with Nvidia MX150 offer lower graphics performance. According to www.digitaltrends.com Dell’s XPS 15 2-in-1 with the same processor and graphics card combination offers about the same graphics performance. However, the GPU performance is in no way high enough for 4K gaming. www.theverge.com recorded 60 fps in League of Legends on medium settings and 4K resolution, but more graphical intense games require Full HD resolution and lower details. The Spectre x360 15-ch004ng comes with a 512 GB PCIe NVMe M.2 SSD. Other options are 256 GB, 1 TB, and 2 TB NVMe M.2 SSDs. In www.laptopmag.com’s test the 512GB M.2 NVMe PCIe SSD in their test sample duplicated 4.97 GB of multimedia files in 18 seconds, for a rate of 282.7 MBps, which is higher than their 283 MBps premium-notebook average, but lower than most laptops’ in their comparison group. www.digitaltrends.com measured a maximum temperature of 126 degrees Fahrenheit (~52 degrees Celsius) on the bottom rear of the chassis and recommends to keep the laptop off your lap when the fans start to kick up. www.laptopmag.com reports, “The Spectre x360 runs a little warm, but it's not too hot.”. They measured between 96 (~35.5 °C) and 99 (~37 °C) degrees Fahrenheit on the underside, 82 Fahrenheit (~28 °C) on the touchpad and 93 Fahrenheit (~34 °C) on the keyboard. laptops.pczubehortest.ga reports that the fan is quite audible. The speakers are tuned by Bang & Olufsen. www.digitaltrends.com says that the speakers struggle with treble when the volume exceeds 90 percent. www.theverge.com thinks audio reproduction is composed of treble and a hollowness and the speakers can fill a small room, but don’t sound that great. 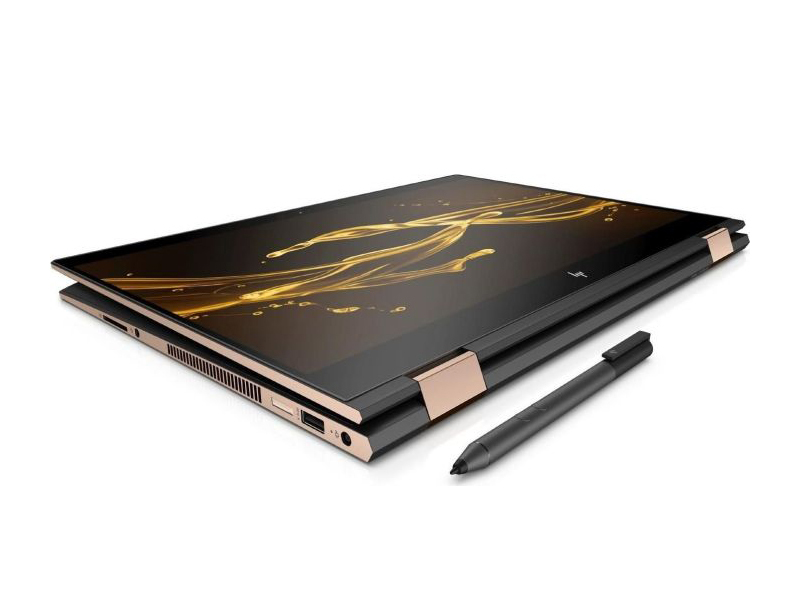 The HP Spectre x360 15-ch004ng is powered by a lithium-ion battery with 6 cells and a capacity of 84 Wh. The laptop lasted 6.5 hours in www.digitaltrends.com’s web browsing loop and barely more than three hours in their most demanding web benchmark loop. In www.laptopmag.com’s battery test (web browsing over Wi-Fi at 150 nits), this convertible lasted 5 hours and 27 minutes. This on-line magazine summarizes that while those scores are noticeably better than the Dell XPS 15 2-in-1’s, they fall behind what they expect from a modern laptop. www.theverge.com recommends to bring your charger if you expect to use the Spectre x360 for a plane flight or at a campus library. In contrast, www.pcworld.com thinks battery life is relatively good for the laptop’s power demands and configuration. The battery is charged via a proprietary power-in and not one of the available USB-C ports. Many on-line magazines like the X360’s excellent CPU performance and 1080p gaming capabilities, but complain about size and weight in tablet use, and battery life. For www.theverge.com the Spectre X360 15 lacks harmony when it comes to nailing the right balance for creative users and mobile warriors who want quad-core performance and 4K visuals in a portable package. www.digitaltrends.com recommends not to buy this machine since the 2-in-1-design is not that suitable for a big, chunky machine with short battery life. As of 07-23-2018, the HP Spectre x360 15-ch004ng is offered by amazon.de for 1,975.77 Euro. In the US, HP currently sells the HP Spectre x360 - 15t Touch Laptop with equivalent configuration for 1720 Dollars. The closest competitor is probably the Dell XPS 15 2-in-1. The Asus Flip 15 with Intel Core i7-8550U, Nvidia GeForce GTX 1050 with 2 GB VRAM, 2 TB HDD, 256 GB SSD, and 4K display offers comparably hardware for a similar price. The most more expensive Microsoft Surface Book 2 (lower CPU performance, higher gaming, graphical performance) is more useful as tablet thanks to its detachable screen. If you want to save money you and can live with lower graphics performance you can also consider, for example, the much cheaper Lenovo’s Yoga 720 (7th generation CPU, integrated graphics chip).